Let’s meet a group of farmers that are actively connecting with schools and early care sites to encourage lifelong healthy eating habits. The Hmong American Farmers Association (HAFA) Farm is part farm, part educational institution. Its members are Hmong immigrants from Laos and Thailand. HAFA’s members (farmers) grow over 160 varieties of fruits and vegetables. Depending on the season, you can find watermelon, ground cherries, and cantaloupe, as well as asparagus, green onions, spinach, and bell peppers growing on the farm. All of the crops are grown using sustainable practices and low-mechanized techniques. HAFA Farmers are trained in Good Agricultural Practices and hold food safety practice at the utmost value. The Hmong culture is deeply rooted in agriculture. Many families farmed in Laos and Thailand for the purpose of feeding their families and as a source of their livelihood. 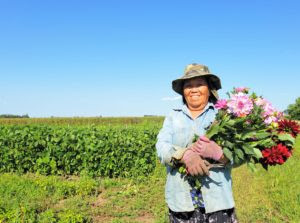 Upon immigrating to the US, a majority of Hmong people faced barriers to farming including difficulty accessing land and, in recent years, saturation of farmers markets. HAFA provides farmer members with access to land, training, research, advocacy, and alternative markets. HAFA farmers grow many mainstream crops (potatoes, carrots, tomatoes, etc. ), but they also grow more culturally-centered produce such as bitter melon, bok-choy, Thai Basil, and cilantro. In 2015, HAFA served more than 70,000 children in the Minneapolis-St. Paul metropolitan area. In addition over 300 students ages three to 23 visited the HAFA farm to learn more about Hmong farmers and how produce is grown. In 2018, HAFA is providing green beans, red and yellow onions, and tri-color carrots to Minneapolis Public Schools. Yukon Gold and red potatoes, green beans, and carrots will be provided to St. Paul Public Schools. HAFA has also provided rhubarb, cabbage, cucumbers, and dill to the Hopkins School District for this summer and plans to provide potatoes, onions, broccoli, cauliflower, and green beans for the fall. HAFA will partner with DeLaSalle High School for the first time this year. They are interested in procuring cabbage, carrots, onions, bell peppers, tomatoes, and cucumbers from HAFA. The Minnesota Agriculture in the Classroom (MAITC) program has featured the HAFA Farm in several resources for educators and students. The three-minute video “From the Field to the Farmers Market” is narrated by nine-year-old Mason who describes how his family (HAFA members) grows produce that he helps sell at the St. Paul Farmers Market. This video has been a hit with Mason’s third grade classmates at St. Paul Academy as well as elementary students across the state. MAITC also profiled the HAFA Farm in their new Specialty Crop AgMag designed to build awareness for how fruits and vegetables are grown and to inspire kids to eat them. This AgMag is aligned to science and social studies academic standards for third graders. Both of these resources, as well as many others, are available FREE at https://mn.agclassroom.org.